hat-002 This sample is printed on a 2" x 3" badge. 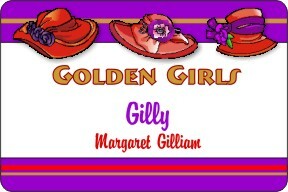 The background is a pale violet with a red hat and purple scarf as the image. All items on this badge can be a different color. If you prefer a pink hat with a violet scarf decoration, all you need to do is to specify that in the comments area of the order. The font used in this sample is Edwardian Script. Hat-004 This badge is best when printed as shown on our 2" x 3" badge. 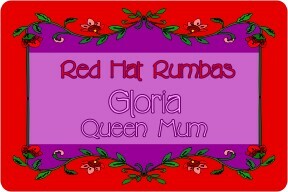 The background is a bold red, dark violet and violet with a red hat and vining flowers. The background colors and hat colors can be changed if you prefer, all you need to do is to specify that in the comments area of the order. 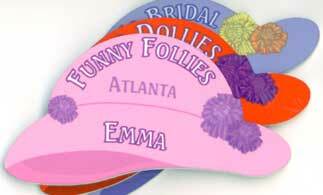 The font used in this sample is Cricket which is not part of our regular font list. If you would like this font or some other font not in our font list, please note that in the comments area of your order. 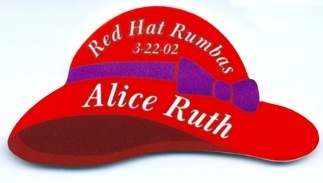 RedHats5 This sample is shown on a 2" x 3" badge. The The font used in this sample is line 1 - Bremen, lines 2 and 3 are Brandy Script. 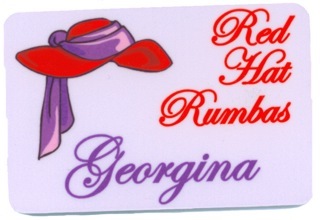 If you wish to have your badge with these fonts, just note in the comments area "please use the same fonts as in your sample".